This comes from our friend Michael Morgan. Sometimes, the best stuff flies under the radar. C.f. Futurama. It may be a hard sell to call anything produced by Matt Groening “under the radar,” but it’s certainly living in the even-yet-lengthening shadow of The Simpsons. Suffice it to say that the show has aired four series finales and you’ll understand its small share of the limelight. But, unlike Sit Down, Shut up, Golan the Insatiable, and Axe Cop—other feckless Fox animations—Futurama wouldn’t die, which is a testament to its excellence. For the uninitiated, Futurama happens in the year 3000 and centers on Fry, a 20th-century delivery boy who, cryogenically frozen on a prank pizza order, wakes up 1000 years after NYE 1999. He meets a cyclops named Leela, a robot named Bender, and starts a new life as, well, a delivery boy again, this time for the boutique intergalactic parcel co. Planet Express. Which is owned by a mad scientist and employees a rastafarian bureaucrat, a lobster doctor, and the daughter of casino barons on Mars. Cue theme music. It’s this robot, Bender, who will bring us to RF Capon. Capon made his dent in the theological discourse, ironically, by articulating the left-handed genius of God’s actions. God, he argues, does not favor the direct effect, straight-line, “right-handed” power of, say, a hammer or a prize fighter (both notable dent makers), but instead opts for oblique and hard-to-suss left-handed power that can dip so far below our radar as to be indecipherable if not completely imperceptible. That God the Son would die to save us while we go on living (until we also die) is a prime example of left-handed power. Grappled straight on, it makes no sense. We opt for kings and armies (or legislation and judicial parsing) while Jesus comes in on a donkey, gets whipped and betrayed, and then nailed to a cross. Even though (or maybe because) we find the actual method of divine power quite dubious, we usually fall to the temptation to play god by our (simpler) logic. And so often with unintended and woeful effect. We protect our kids and accidentally shelter them from the risks and mishaps that actually bring maturity. We enact Prohibition and create the mob. The best laid plans of mice and men are tricky to get right. Perhaps our ineptitude here owes by and large to the fact that there’s an entire dimension to the universe that we cannot see and therefore overlook in our devising. The world of spirit, after all, is invisible by definition, hidden even, yet it is inseparable and essential to existence. Neglecting this, we machinate and calculate and we wield our right hand half blind. The mess is tragic and inevitable. May I now reintroduce to you Bender: a profane robot of profound self-interest. Even his name drips with right-handed effect. His sole named-for function is bending things. In this shiny metal corpus we see both our motivation for and use of straight-line power fully fledged. Like us, Bender plays god. Only more literally. 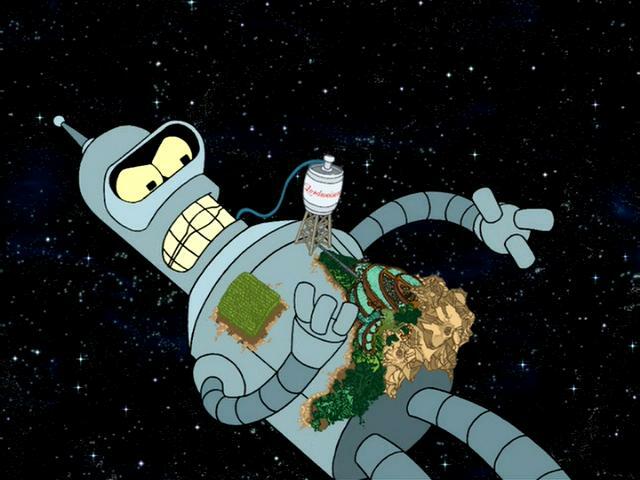 In the award-winning episode “Godfellas”, by means that defy physics only a little, Bender hurtles irretrievably through deep space, populated by a race of tiny aliens who venerate him as their god. All seems well as this micro society erects a microbrewery with which to give their god offerings of refreshing libation (and fuel since 31st century robots run on booze). The industry of the people, though, leads them to need which in turn leads them to prayer. Snagged here, things unravel in a nice, Capon-ian way. Every intercession to which Bender exerts his divine will comes to disaster. Rain becomes flood. Sun for the hops ignites a rampant fire. God-ing ain’t easy. Meanwhile, Fry has lit out in search of his best friend, invaded a Buddhist monastery, and shut the monks into a closet so he can commandeer their deep space satellite (formerly used to search for God) to search for Bender. The robot, conspicuously alone again, eventually drifts into the presence of what might (or might not) be the god of the Futurama universe. Bender, dejected, homesick, but extroverted, strikes up a conversation. This god turns out to be rather coy. Its highest revelation is that, when it comes to doing god stuff, “If you do things right, people won’t be sure you’ve done anything at all.” How very left-handed. While a bit distant from the usual creeds and catechisms, this depiction does offer some comfort all the same. Where Futurama succeeds is in giving an honest account of how God’s intervention actually appears to our eyes, ears, and logic. It is oblique and, even if we do catch a glimpse, all too easy to rationalize away as a trick of the light. A Capon left hook. If God is only interested in mystery, though, our world would be a hell of uncertainty and laughable self reliance. Observant folks can be forgiven for fearing that such is, in fact, the case. Blessedly, God—the proper God—blends his mystery with revelation (to more than just the occasional passing robot). We have a book brimming with a fuller glimpse, even a full-enough glimpse, of God. Better than we’d ever put together by our own moxie. The Scriptures give us bathymetric charts for at least some of the invisible contours of the spiritual depths and, more importantly, give us constant assurance that God is at work intervening and guiding and generally holding it all together. This distinction is a huge relief when it comes to our motivation. At the end of philosophizing and theologizing, we have to, you know, do stuff. Where Futurama gives us Bender letting the monks out of the broom closet because god is a big jerk whom you can’t count on to do anything, a robust biblical worldview reveals a God who, while no less inscrutable in action, is at work and trustworthy all the same. We still ought to let the monks out of the closet, but our motivation is the hope of joining our straight-line action to the oblique work of God. This is a thoroughly daunting note to end on, joining our feeble and fumbling efforts to the left-handed genius of God. May grace free us from the weight. God can work his ends out of even our flimsy means and has apparently chosen to do so. How very left-handed indeed.